AIP Friendly! No Irritative spices, no nightshades. Convenient and portable, no hasssle snacks. lamb & veggie bars rosemary spinach: natural lamb, organic vegetables, & fruit (spinach, apricots, dates, garlic, onion), sea salt, oregano, celery powder, rosemary, turmeric. mountain sticks cranberry aip friendly beef & organ meat: beef, beef heart, beef kidney, dried cranberries (organic cranberries, blackberry honey), redmond ancient sea salt, ginger, onion, garlic, celery powder, cinammon, lactic acid starter culture, packed in collagen casing. instant farina aip friendly & nut free -- trial size: organic coconut, organic tiger nut flour, organic cinnamon, konjac root, himalayan pink salt. Pick up this great snack pack at a sweet discount! All of our most popular AIP snacks in one bundle. 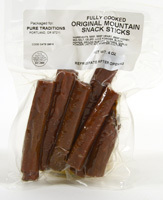 Mountain Sticks: We took our popular original grass-fed beef and organ stick and remade it from the ground up to be AIP (Auto-Immune Protocol) friendly. And we ended up with something so tasty that this might just be your new favorite version regardless of any dietary limitations. Wild Zora Lamb & Veggie Bar: Lamb Wild Zora Bars are a delicious and savory Mediterranean-inspired lamb recipe with highlights of rosemary and spinach that is nightshade-free (without tomatoes or peppers). With a nod towards those with compromised immune systems, we also add turmeric for its anti-inflammatory properties. Farina: Just add hot water and wait 2 minutes, it's that quick and easy! Perfect as it is, or you can also add fresh fruit, butter/ghee or any of your favorite hot cereal additions. 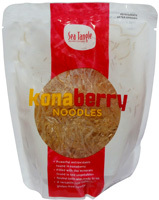 A delicious and healthy alternative to oatmeal or any other grain-based, gluten containing hot cereal out there. 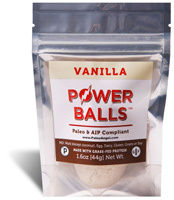 Power Balls: Delicious, melt-in-your-mouth, buttery cinnamon goodness! Don't worry, we don't actually use butter or any dairy! These are AIP and Paleo compliant.